Over the holidays, Dan and I took advantage of our free schedule and took a day trip out to the Hudson Valley. I've been meaning to explore the area a lot more, as it's no doubt known for amazing local food and beautiful scenery. Deciding to visit the quaint town of Beacon, know for its larger than life Dia:Beacon museum, we explored the town as well and indulged in a few good eats. 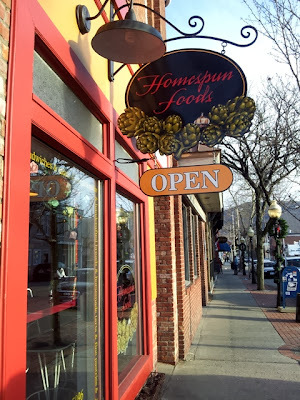 Homespun Foods, which is not only found as a little outpost at the museum, also has a flagship location on Main Street, which is where we stopped in for lunch. Kitschy and eclectic, Homespun Foods presents a fun, casual setting for local diners during breakfast and lunch hours. It's not unlikely that you'll bump into the same folks you just noticed at the museum, as the two institutions have a nice partnership. The place itself is set up as a cafe and a little general store rolled into one. Not only can you casually place your order, take a seat at their vintage, mismatched tables and chairs, but you can also just drop in, pick up some local eggs, dairy, and specialty desserts. Dan and I appreciated this spontaneous quality of Homespun, instead of having to wait around to be served. Both kids and adults are welcome, as the menu helps accommodate a younger clientele as well. Mostly made up of soups, salads and sandwiches, the menu is no doubt simple, but filled with high quality ingredients such as locally sourced dairy and vegetables. You can taste the freshness in each bite! Harvest Salad - Only available in the fall and winter, this beautiful salad combines a medley of seasonal ingredients such as roasted squash, beets, apples, pumpkin seeds, dried cranberries, chevre cheese and a pomegranate dressing. The whole thing was vibrant and beautiful and tasted spectacular, especially the tangy cheese, which helped cut the sweetness of the squash and the cranberries. As you can see, the portion was gargantuan, but everything was so tasty that I nearly polished the whole thing off. Sopressatta, Salami, and Provolone Sandwich - Dan was more in the mood for something carbie and went for one of their colossal sandwiches, this one being Italian themed. It looked absolutely gorgeous, with a rustic, crusty exterior and a warm melty interior, which was laced with the smoky cured meat. I had a few bites and absolutely fell in love with that wholesome bread. Beer - How can we enjoy this amazing meal without a proper beverage to wash it down with? Personally, I went for Keegan Ales Mothers Milk stout, which was rich and frothy with hints of oatmeal and chocolate. A perfect winter elixir, I must say. We found the folks at Homespun Foods to be just as relaxed as its atmosphere, and overall, they were pleasant deal with. Coming out of the big city, we found this quintessential small town vibe welcome and refreshing. All this local goodness comes at a premium price no doubt, as our lunch set us back about $36, which includes my salad, Dan's sandwich and two beers. Thanks for a fun trip, Beacon - we'll certainly be back in the spring!